From I-5 southbound, take the NE 45th Street exit (#169). Stay on the left lane to NE 45th street. Turn left onto NE 45th Street. Continue east about a one-half mile to 17th Avenue NE. Turn right onto Memorial Way. Pass the gatehouse and the intersection, pass the flag pole, keeping right. You will see the Henry Art Gallery on your right and the George Washington Statue on your left. Park on the black top and drop off students before the cross way/red bricks. DO NOT PARK ON THE BRICKS. From I-5 southbound, take the NE 45th Street exit (#169). Stay on the right lane to NE 45th Street. Turn right onto NE 45th Street. Continue east about a one-half mile to 17th Avenue NE. You will see the Henry Art Gallery on your right and the George Washington Statute on your left. DO NOT PARK ON THE RED BRICKS. Please turn off your engine while loading/unloading. After dropping off the students continue to the stop sign and turn Left on to Stevens Way. Follow Stevens Way to Pend Oreille and take a right. Continue straight to Montlake Boulevard, and take a right. Turn left onto Wahkiahum Road and left into the E18 parking lot. If parking slots are full please see one of the gate houses for spill over parking. From I-5 Southbound, take the NE 45th Street exit (#169). 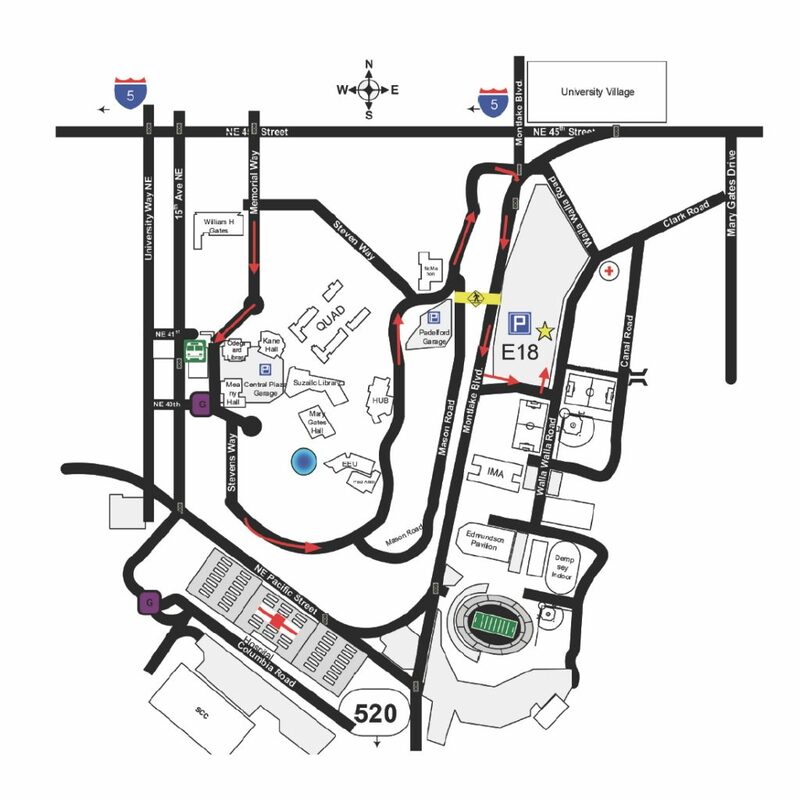 Turn right onto the main campus and stop at Gate #2 for directions and a parking permit. Turn right onto NE 45th Street and continue east about half a mile to 17th Avenue NE. Turn right onto the main campus and stop at the Gate #2 for directions and a parking permit.